What Is The Best 5x5 Workout That Will Produce Amazing Muscle Gain? What is the best 5x5 workout that will produce amazing muscle gain? Our forum members share their take on the program, sample workouts, who would benefit or not, and more! Try the program and see if it works for you! TOPIC: What Is The Best 5x5 Workout That Will Produce Amazing Muscle Gain? Training does not have to be as complicated as they might look in the magazines and might even be inappropriate depending on what level you are at. Standard training programs that have been tried and tested over the years are hard to beat. The 5x5 program is one that has been tested and proven successful. What is the best 5x5 workout? Be specific. Include frequency, sets, reps, rest between sets, etc. Who would benefit from such a workout? Who would not? What method(s) can be applied to the 5x5 that would be more appropriate for more advanced trainers? How much cardio if any would be beneficial for this type of workout? 1st place - $75 in store credit. 2nd place - $50 in store credit. View This Author's BodySpace Here. With all of the different exercises, weights, sets, reps, rest and routine splits you almost need a photographic memory or logbook to know how your workout for the day should go. Is your day too busy to have to deal with such a complicating workout program? Or are you an experienced weightlifter looking for a different routine to prevent muscle adaptation? Maybe you are a beginner looking for a way to breakthrough into the weightlifting scene. Whoever you are, the 5x5 method is a great routine to use and switch-up your workouts. In this article I'll go over a basic 5x5 routine along with condiments that can be added to the routine for advanced weightlifters. Also discussed will be the question of cardio and the benefits of the 5x5 routine. Whether you are satisfied with your current routine or not, learning the 5x5 method will prove useful in the future when it's time to switch workout programs. So here it is, the 5x5 method explained in depth. To begin with, the principal of 5x5 is obvious, five reps each set for five sets. As for the exercises done, the 5x5 method recommends working each body part at least twice a week. This means compound exercises should be mostly used with a few isolation exercises included to fill in any gaps. So in order to create an efficient 5x5 program, you want to use compound exercises as much as possible with isolations to only hit muscles that aren't fully worked with compound exercises. Once you scan Bodybuilding.com's muscle and exercise database and put an efficient combination of exercises into a program, the end result looks like this. Rest: ~ 90 seconds between sets. ~ 3 minutes between exercises. As you can see from the above workout, every muscle is worked in an equal fashion. Isolation exercises are kept to only filling in gaps that compound exercises miss. Warm-up exercises may be done and are recommended because of the heavy weight this routine will have you lifting. Lifting weight with warmed up muscles will allow you to lift more weight than you would with cold muscles. To warm-up your muscles, simply do a set with about half of the weight that you will do for the normal set. For instance if it's time to incline bench press and you will use 200 pounds for the normal set, add a 45-pound plate on each side and do a warm-up set. If you are about to do weighted pull-ups, to warm-up you could do a set of pull-ups with only bodyweight. The key point to this workout is remembering to increase the weight used every week. Since the number of reps and sets don't change, every week you should add at least 5 total pounds (2.5-pound plate on each side) for each exercise. That is how you make progress, by forcing yourself to add weight each time in the gym. You'll notice a couple of weeks after forcing to add the 5 extra pounds that the previous weight will seem like baby-weight. Add At Least 5 Pounds For Each Exercise Every Week. These exercises are not set in stone, other exercises can be substituted in if need be. Three reasons you might want to substitute different exercises in are: because you don't have access to certain equipment, some exercises may be too difficult at the moment (weighted pull-ups), or you just completed a routine that included some of these exercises and want a change of pace. Whatever your reason is for substituting an exercise in, you can find a list of exercises for each body part at this link. Depending on your goals, the proper diet will vary. There are various articles on Bodybuilding.com describing how to correctly diet. The benefits of 5x5 training vary, so the people that would benefit from 5x5 vary. A 5x5 program is a simple routine that is aimed for building functional strength. Thus a great and probably the best benefactor of 5x5 training would be a beginner. Beginners start off weak and should be focused on increasing their strength first of all, something that 5x5 does best. Add in the fact that the routine is simple and it makes it all the more attractive to a beginner. However a beginner isn't the only person who would benefit. Seasoned lifters will find success in this program because of the ability to switch their routine up. It is common knowledge that muscles strive to adapt to the environment, and is the reason they grow when worked out. It is also known that doing the same routine for a long time will accustom your muscles to the exercises, decreasing their growth. This means an experienced lifter can have a welcomed change in routine by switching to 5x5. It is even a greater benefit when used during the bulking months, where more muscle outweighs a leaner body. The people who would not benefit the most are those that are in a cutting phase. While muscle size and strength would still be gained when doing 5x5, it is not the optimal routine because the low reps focus solely on strength. Usually a bodybuilder in the cutting stage is looking for a more defined physique, something that is achieved with moderate reps and moderate weight due to the increased blood flow to the muscles. Someone else that wouldn't greatly benefit is a casual lifter. Casual lifters are usually looking to improve their body image and do not keep up with the latest research on bodybuilding. Thus using the heavy weight required with 5x5 could bring injury upon the lifter if done with improper form. A casual lifter may watch the movie Rocky and go to the gym that day looking to do heavy behind the neck presses without the knowledge that they can be detrimental to your shoulders. The 5x5 program does not have to be simple and concrete; some bodybuilders rather customize their workouts to match their goals. One method that can be applied is called "Cluster training." The idea behind cluster training is simple, and can be a great tool for breaking out of a plateau. All you do is take ~90% of your 1-rep max and do a rep followed by 10 seconds of rest, do that until you've completed your 5 reps. So for example if you were doing bicep curls with 135 pounds, just take 90% of that (~120 pounds) and do 5 reps in cluster fashion. I wouldn't solely rely on cluster training, however I'd recommend it one week out of every four or so. It's just a way to switch up your training and possibly increasing your strength more so than a normal set would. If you are naturally gifted with a high recovery rate and want a change of routine, you may want to switch to a full body program. This is where you work your entire body in one day, three times a week (ex. Mon, Wed, Fri). When doing this it's important to remember workouts should still be kept to no more than an hour apiece. This means you'll have to cut out more isolation work and incorporate more compound exercises each day. An advantage to doing a one day, full-body routine is that you are able to work each muscle three times a week, as opposed to twice a week. It also has a disadvantage though, like I mentioned you will have to cut out isolation work and do more compound exercises. This could work your muscles less since you won't be hitting them directly. It's all about knowing your body and what works best for it. Unless you are in a cutting phase, which I don't think is optimal for 5x5 training anyway, then cardio should be kept to a minimum. The only reason I'd recommend a day of cardio a week is to keep your endurance up. Otherwise cardio just burns a large amount of calories, hindering your bulking goals. If you do decide to do cardio on a bulking diet, remember to eat enough calories to compensate for the calories that will be burnt during cardio. Carbohydrates are most recommended to be consumed before cardio, to give your body something to use for energy as opposed to using muscle. A basic cardio workout would be a 20-minute run, punching bag or stationary bike ... Anything that will raise your heart rate for a long duration, increasing your endurance. To conclude, 5x5 training is a welcome change from the standard workout program. Beginners and experienced lifters alike should try it; remember stronger muscles equal more size gains in the long run. You may currently be in a routine that includes bodyweight dips for 12 reps. As of now you can only do 12 reps, however I can guarantee you after doing an extreme functional strength program such as 5x5, 12 bodyweight dips will seem like nothing. It is easy to get comfortable in a routine and never break away from it. Remember that once you get comfortable in a routine, your muscles also get comfortable, and comfortable muscles don't like to grow. So I'd highly recommend giving 5x5 a try, freshen up and simplify your workouts! Madcow's version of the 5X5 is without a doubt, the best 5X5 protocol to date. What makes Madcow's version so great, is weekly progression in weight that is built into the program. The program is based off of taking your current 5-rep maxes in your compound exercises, lowering the weight and building back up to them in a timeframe of 2-4 weeks. Also, the focus upon the major compound lifts makes Madcow's version tough to beat. Click Here For A Printable Log Of Monday. Squat: 4X5 - First 3 sets the same as Monday, and the 4th set is the same as the 3rd. Click Here For A Printable Log Of Wednesday. Squat: 4x5, 1x3, 1x8 - The first 4 sets are the same as Monday. The 5th set - Heavy Triple is 2.5% more than Monday's final set of five. The 6th set uses the weight from the 3rd set for 8 reps. Bench: 4x5, 1x3, 1x8 - The first 4 sets are the same as Monday. The 5th set - Heavy Triple is 2.5% more than Monday's final set of five. The 6th set uses the weight from the 3rd set for 8 reps.
Barbell Row: 4x5, 1x3, 1x8 - The first 4 sets are the same as Monday. The 5th set - Heavy Triple is 2.5% more than Monday's final set of five. The 6th set uses the weight from the 3rd set for 8 reps.
Click Here For A Printable Log Of Friday. OK, as we can see, the exercise selection is simple. The progression is what makes the program. At the most basic level, every week, you are aiming to increase your top set of 5 of Monday by 2.5% on Friday (done for 3 reps). If completed, this becomes your top set of 5 on the following Monday. For example, if your top set of 5 on Monday for squats was 100, your heavy triple on Friday would be 102.5. On the following Monday, your top set of 5 would then be 102.5, and so on. On Wednesday, for the Deadlift and Military Press, just try to increase your top set of 5 by 2.5% each week. These small increases make the program. I highly suggest in investing in micro-plates (1.25 lbs. ), or going to home depot, getting some chains+hooks, and rigging something up to put on the bar. This seems like a pain, but you will be able to progress for a much longer period of time by making smaller jumps in weight. Now, back to the progression. Obviously, if you simply start the program at your 5-rep max on Monday, you are bound to fail early in the program. 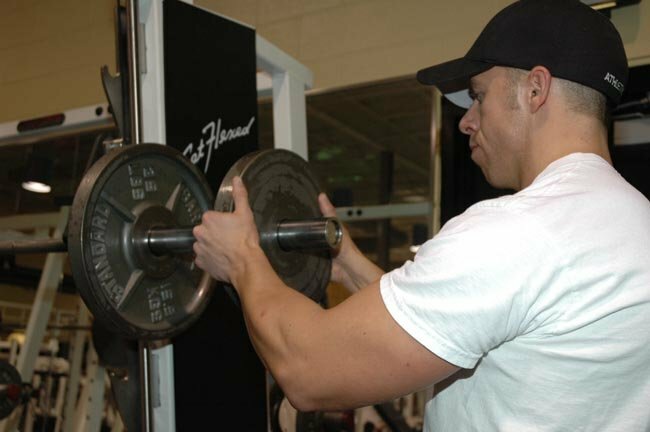 You must give yourself 3-4 weeks to get back to your maxes. Madcow recommends setting it up, so that in 4 weeks after starting the program, you are back at your starting maxes. This means about 10% (2.5% a week X 4 should put you back where you started). The beauty of the program is that when you reach your starting 5-rep max in week 4, you will be much stronger and will be able to handle it much more easily than before. Now, we must explain the "ramping" of weights for the sets. 5 sets of 5 reps includes your warm-up. You ARE NOT doing all 5 sets at the same weight. Generally, you want to increase the weight by 12.5% on each set of five, up to your pre-determined 5 rep max for that week. REMEMBER - If you are in week one, you will be working up to a top set of 5 that is 10% below your current 5 rep max. Now, we must remember that 12.5% will not always give us a "perfect" weight. Somewhere between 10-15% is the desired increase in weight. To do this, take your top set of five, and work backwards by subtracting 12.5% of it. This will give you your 4th set. Subtract 12.5% of the 4th set, and you have your third set, and so on. While we could do this out for everything, Madcow has set up a nice Excel spreadsheet that does it ALL for you. This will basically set the entire program up for you!! Do NOT do any more assistance work! This will be just fine. The focus of this program is on the compound lifts. YES - your arms will grow - Trust me! Who Would Benefit From This Program, Who Would Not? I felt that most lifters newer to bodybuilding (or ones that have never used a PROVEN program) can benefit the most from this program. Advanced trainees will have a hard time increasing their weights in a linear fashion, because they are already lifting a large amount of weight. I feel that people with 1-4 years experience should give this program a go. Obviously that is a rough estimate, but this program is best suited for intermediate trainees. For the more advanced trainee, Madcow has a periodized version of the 5X5. This can be found on the same site. It includes loading and de-loading phases, that are more tailored to experienced lifters. Also, the program doesn't progress in a linear fashion like the intermediate program. More info can be found on Madcow's website. How Much Cardio If Any, Would Be Beneficial For This Type Of Workout? I feel cardio should always be a part of a training regimen. I also feel that High Intensity Interval Training is the way to go while bulking. This helps keep the fat off, endurance up and your heart healthy. HIIT two times a week for 15-20 minutes is plenty for bulking. There is nothing wrong with low-intensity cardio, so if you prefer that, then I suggest 3X a week for 30-35 minutes. Either way, do what you like, because being healthy is all a part of being able to lift some serious weight. I suggest this program for bulking, but it can be used for cutting as well. Let's get one thing straight though - If you want to put on muscle, you MUST eat above maintenance calories. No program, not even a great one like this will put on muscle unless you are eating enough calories to do so. EAT! End of story! I can't take credit for this program. Madcow wrote it up, and it is his take on the 5X5. Workout of the Week is where forum members are asked to answer questions about what they think the best workouts are.